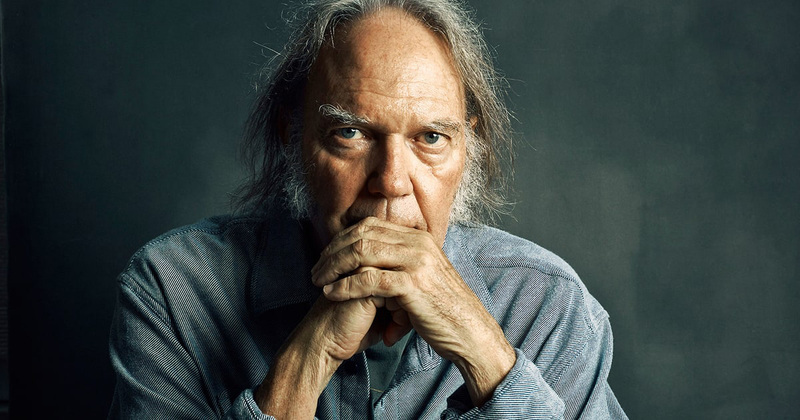 Perhaps the most influential folk rock singer-songwriter to ever emerge from Canada, Neil Young initially rose to prominence in 1966 as the co-founder and primary songwriter of Buffalo Springfield. He later gained much acclaim and recognition as a member of Crosby, Stills, Nash & Young, as well as a highly successful and respected solo recording artist. Often referred to as the “Godfather of Grunge”, Young’s body of work is known as much for its intellectual depth as it is for its musical brilliance and diversity. He has sold more than 30 million records worldwide. Born “Neil Percival Young” in Toronto, Canada in 1945, his father was a journalist and sportswriter while his mother was a social activist. Young was diagnosed with diabetes as a child and recovered from a polio bout in 1951. He developed an early interest in music and grew up listening to radio and idolizing Elvis Presley. His father abandoned the family when Young was only 12 years old. Young learned to play musical instruments, such as ukulele and guitar, as a teenager and played in several bands in high school. Neil Young joined his first musical group, the Squires, when he was still in high school. His Squires bandmate Stephen Stills would later become an integral part of his musical journey. After moving to Toronto in 1966, Young formed the Mynah Birds, a Motown R&B band. After the Mynah Birds broke up, he relocated to Los Angeles and founded Buffalo Springfield with his old friend, Stephen Stills. The group, under the leadership of Young and Stills, eventually became one of the most important folk rock acts of 1960s. Unfortunately, tensions within the group resulted in their breakup in 1968. Young embarked on a solo career and a signed a deal with Reprise Records. Although his 1968 eponymous debut album received mixed reviews and failed to chart completely, he was a leading figure of the folk-rock movement that would dominate much of the 1970s. His next album, Everybody Knows This Is Nowhere, peaked at number 34 on the US Billboard 200. Although Young performed at the Woodstock Festival as a solo act, he joined Crosby, Stills & Nash for a few songs. The event led to him joining the group to record their 1970 album, Déjà Vu. The album topped the pop album chart for one week and spawned three hit singles: “Woodstock”, “Teach Your Children”, and “Our House”, selling more than seven million copies worldwide. After the album’s massive popularity, the group toured as Crosby, Stills, Nash & Young with great success and fame. Young wrote “Ohio” in response to the killing of students by National Guard troops at Kent State University in 1970. The song became one of the group’s biggest hits, peaking at number 14 on the US Billboard Hot 100. Neil Young has won numerous awards and accolades for his solo work, including two Grammy Awards, and several Juno Awards. He has been inducted into the Rock and Roll Hall of Fame (1995), and into Canadian Music Hall of Fame (1982). Neil Young married Pegi Morton, then a waitress, in 1978. The couple have two children: Ben and Amber. The marriage ended in a divorce in 2014, after 36 years of marriage. Young is also a well-known environmentalist and philanthropist.